we plan to merge libfwbuilder and fwbuilder packages into one "fwbuilder" package to simplify package management and make installation easier for the users. Libfwbuilder will become a directory inside fwbuilder code tree and all executables will link with it statically. This reduces number of files we install in different parts of the file system and makes it easier for the users to both build from source and to install binary packages. The change is planned to go live in the next release of fwbuilder tentatively numbered "4.2" some time in the next month or two. The change only affects our Linux and FreeBSD/OpenBSD packages. The side effect of this change is that we won't install header files and dynamic libraries and won't make libfwbuilder-devel package anymore. Please let me know asap if you have any code that depends on these files or know of a project that does. As we head in to the holiday season Vadim and I wanted to wish everyone in the Firewall Builder community Happy Holidays! The end of the year also provides a good opportunity to pause and reflect so we thought we would share some of our thoughts about 2010. 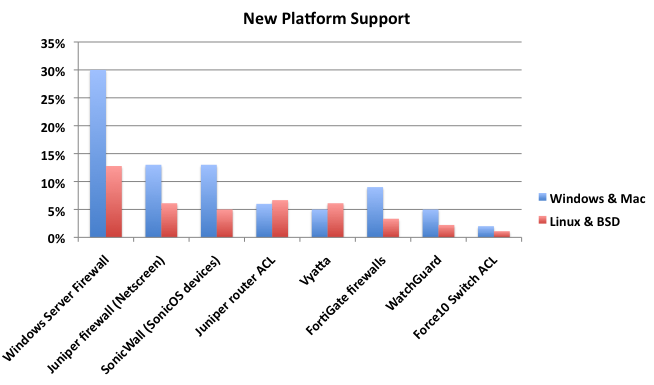 It has been a very exciting year for both NetCitadel and the Firewall Builder project. The fireworks started in May when Firewall Builder version 4.0 was released. This was a major release that brought critical new features such as support for high availability cluster configurations as well as continuing to improve the stability and usability of Firewall Builder. That was followed in August with V4.1 which included features like support for iptables ipset and integrated SSH/SCP clients for Windows packages. Since then we have released a few patch releases and have been working on adding new features to Firewall Builder. While a large percentage of the community has already upgraded to V4.x to our surprise we still run into users that are running versions as old as Firewall Builder V2.0! If you are running a version below V4.0 we hope that you upgrade in 2011! 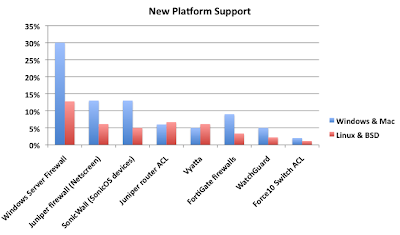 In the fall we announced the availability of support contracts for open source users. This was part of our push to expand the products and services NetCitadel provides around the Firewall Builder project. We plan to offer more products and services in 2011, stay tuned for more information soon. In addition to the product enhancements we have continued to work to improve in other areas as well. We have been adding more documentation and have updated our website to make it easier to find the information you are looking for and for new users to figure out what we do. We expect to do much more of that in the coming year. Finally, we wanted to say thank you to our customers who have supported us this year by purchasing a commercial Firewall Builder license or open source support contract. Our goal is to provide the best firewall management solution available and we are confident you will see lots of exciting progress in 2011! The inspiration for our latest cookbook recipe, "Double" NAT (Source and Destination Translation), came from a user support request. Due to some complicating factors in the user's network they needed to NAT inbound windows remote desktop connections with both a source and destination NAT. 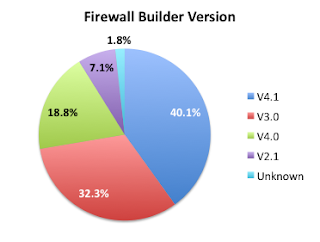 We are happy to announce that Firewall Builder V4.1.3 is now available! This release includes a number of usability improvements and bug fixes. A complete listing of enhancements and bug fixes can be found in the V4.1.3 release notes on the Firewall Builder website. In our last post we talked about how to use the Firewall Builder cluster feature to create a single firewall ruleset that gets installed on multiple servers. This is great if all your servers should be running exactly the same firewall rules, but what if some of the servers also need to have their own unique rules? Firewall Builder lets you define multiple firewall policies, so you can have a server running a policy configured as part of the cluster and then the same server can also run its own local firewall policies. What you end up with is a cascading chain of firewalls similar to the diagram below. We are always looking for creative ways to use Firewall Builder's technology to simplify firewall management. One challenge we hear from users quite often is how to efficiently manage firewall rules for a large number of servers performing the same function. For example, you might have a group of servers acting as web front ends and each of these servers needs to have the exact same policy as all the other web front end servers. While you could create each server in Firewall Builder and copy-and-paste rules between the servers this is time consuming and it is easy to make a mistake. We have come up with a solution for this problem using Firewall Builder's cluster feature that allows you to define a master firewall policy and apply it to all the members of the cluster. This means that when you need to update a rule that affects multiple servers you only need to make the change in a single firewall policy and then compile and install it on all the cluster members. If you are responsible for managing Cisco router access lists then you know that they can be a pain to manage. Check out the latest Getting Started Guide that explains how to use Firewall Builder to simplify router ACL management. We are collecting ideas for how-to guides and tips & tricks articles, so if there is a topic you would like to see covered please leave us a comment. Today we announced the availability of support contracts for our Linux and BSD users! This is a great step forward for us as we continue to expand not just the features and functionality of the Firewall Builder application, but also expand the services provided by NetCitadel LLC which is the company that supports and develops Firewall Builder. The new support services are offered as packages ranging from "Small Business" to "Ultimate". Each package includes a fixed number of support cases that can be opened during the 1 year support period. Our goal is to make sure there are solutions to fit a range of budgets and needs. We plan to continue adding to the list of services provided by NetCitadel based on user feedback and demand. Stay tuned for more information! We are happy to announce that we released Firewall Builder V4.1.2 this morning. This release includes a few bug fixes and many usability enhancements. After conducting several usability tests with new users we realized that some concepts and areas of the application can be challenging for new users who are trying to get started. To help these new users we have added more visual cues and navigation aids in the GUI. We also simplified the entry fields in several wizards to make it easier to create certain types of new objects. Existing Firewall Builder users who have enabled "tooltips" in their Preferences settings under the Objects tab will now see additional tooltips when editing firewall policies and other areas. If you haven't enabled tooltips, which were disabled by default on all versions before V4.1.2, then you won't see any of these new tips. Let us know what you think of the new enhancements. 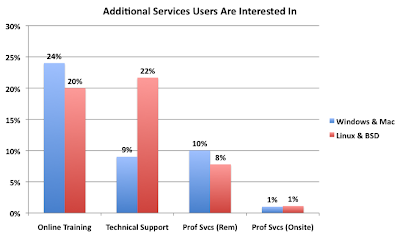 In the last post I went through some of the demographic data about the users who responded to our User Survey. This time I am going to cover more about what new services and features users are asking for. In the last post one of our readers, Scott, asked "What were results of the future direction questions?" Hopefully this post will help answer that question. Firewall Builder users on all platforms were interested in Online Training, so we are looking in to ways to provide training services. These would be done as either pre-recorded content or live training webinars. If you are interested in Firewall Builder training classes, please leave a comment and let us know what topics you would like to see covered in Online Training sessions. 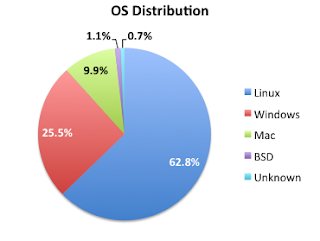 It also turns out that many of our Linux users are interested in having a Technical Support contract, so we are working on developing a support offering to help meet that need. We are still ironing out the details - stay tuned for more information about this in the next couple of weeks. Many of our users would like us to provide remote Professional Services. We are looking at several options in this area, including partnering with security consulting companies that are knowledgeable about using Firewall Builder for firewall management. We are still looking for partners in some regions, so if you are a security consultant and you are interested in partnering with us send me an email at mike 'at' netcitadel 'dot' com. Finally, we asked users about what additional firewall platforms they would like to be able to manage with Firewall Builder. Somewhat surprisingly MS Windows Server (2003 & 2008) was the overwhelming winner in this category. We are currently working on plans to add support for MS Windows Server firewall in a new version of Firewall Builder. If you are interested in helping beta test this feature when it is ready please email me at mike 'at' netcitadel 'dot' com. There were a total of 282 survey responses representing users in over 33 countries. All responses are anonymous and we deleted any obviously fictitious responses. As you can see from the chart below, the majority of users are running Firewall Builder on either Linux or MS Windows systems. There were a good range of software versions represented. Most users are running V3.0 or higher, but we still have some V2.1 users hanging on. There are lots of great new features in V4, so hopefully some of these users will see the light and upgrade soon! 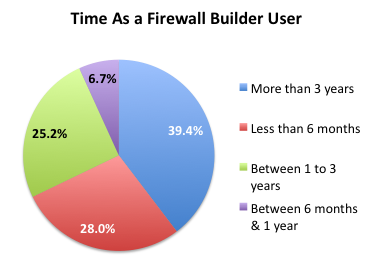 The chart below shows a good distribution of how long users have been using the Firewall Builder application. It is great to see a strong showing from both new users having less than 6 months of usage as well as loyal long time users with over 3 years of usage. Finally, we get to some user satisfaction data. For the most part users appear to be pretty satisfied, but based on the survey responses it looks like Documentation is the area where we can improve the most. We have started to work on improving our Documentation, beginning by adding a new Video Tutorial series to our website (http://www.fwbuilder.org/4.0/videos.html). The first video tutorials will cover the basics of getting started with Firewall Builder, but over time we will add more videos to the library that address more complicated topics and scenarios. If you have ideas for a video tutorial you would like to see, please leave us a note in the comments section. Our first video tutorial for Firewall Builder is now live on our web site at http://www.fwbuilder.org/4.0/videos.html . It covers the basics of the Firewall Builder GUI and we plan to add more videos in the coming weeks, stay tuned ! Firewall Builder User Survey - Last Chance! Thanks to all the Firewall Builder users who have completed the User Survey. Your input helps us with release planning and lets us know where we can improve. After the survey is closed we will share some summary data and key statistics. We are happy to announce that V4.1 is ready for beta testing! You can download the Beta test release for V4.1 from our nightly builds folder, just select the build with the highest release number (3173 right now) to get the latest. Or if you use the Firewall Builder rpm and deb repositories, the "testing" repository is now serving the latest V4.1 beta build as well. If you are a licensed user, V4.1 will be a free upgrade for users that have a valid V4.0 license. We plan to officially release V4.1 in a few weeks once we are confident there are no major issues. There is an article by Dru Lavigne in the July issue of BSD Magazine about using Firewall Builder with the BSD pf firewall. If you are already a Firewall Builder user managing pf firewalls you may not learn anything new from this article, but it provides a good getting started overview for new users. It is great to see a publication like BSD Magazine showcasing Firewall Builder! If you are a Firewall Builder user and live in the SF Bay Area we want to meet you! We will be hosting an informal get together at the Tied House in Mountain View on Thursday June 17th at 6:30pm. Vadim and I will be there to answer questions, talk about Firewall Builder and most importantly to get to know our users better. We want to hear about how you use it today, what you would like to see added or improved and generally hear your thoughts. What's in it for you? Well, to start with there will be free beer and appetizers. This will also be a good chance to network with your peers and meet other Firewall Builder users. The Tied House is close to the Mountain View CalTrain station. There is a meetup page for this event http://www.meetup.com/Firewall-Builder-Users-SF-Bay-Area/. If you could RSVP for this event, either on meetup.com or by emailing me, it will help us make sure we have enough room reserved on the patio. We look forward to seeing you there! Btw, if you don't live in the Bay Area we will be trying to arrange meetups in other locations as our travels bring us to different areas, so stay tuned. This release comes with fixes for several minor bugs in the GUI and other components, improves policy importer for iptables and introduces support for HP ProCurve port and vlan ACLs. Thank you to everyone who helped with testing and provided bug reports and feedback. v4.0 beta is progressing really well. We had a few minor issues but at this time I am not tracking any major problems with it. Please find a time and give it a try, I would like to make sure we find and clear as many problems as possible before the release. That is what beta is for, after all. If things go like they did so far, I hope to make the release mid-April. We are working on the documentation at this time. Article "Introduction to Firewall Builder 4.0" on the nixCraft blog http://www.cyberciti.biz/ was rather popular and I am following it with a second one which is going to be a detailed guide that describes building a firewall configuration for the cluster of two web serves (on-the-host firewall, that is). This guide is interesting in that it starts with Linux servers running iptables and heartbeat but then shows how to convert it to OpenBSD running PF and CARP. The second article should be published on nixCraft blog soon. I am looking for more blogs and professional news sites that would do a review or accept guest posts that I can write. Please send pointers to me if you know of any popular site or blog like that. It would be great if you could do a review or write an article, too. I am offering free license for Firewall Builder 4.0 package for Windows or Mac OS X to those who can write and publish an article or review on their site (or anywhere, for that matter). In this post I go over high level points explaining benefits of Firewall Builder for a system administrator and then look at the new features in Firewall Builder 4.0. This is the first article in a mini-series of two, the second article will demonstrate configuration of a firewall for a cluster of two web servers. Firewall Builder 4.0 is very close to the point where it will be released as public beta. We are doing last minor bug fixes and wating for the "GUI" section of the Users Guide to be rewritten to reflect changes in the GUI. Hopefully we'll start public beta mid-March. Stay tuned!